A brand new item, an A5 Light up LED cinematic Box. A finishing touch for any party / gathering; the box is equipped with 82 interchangeable pieces, including a mix of letters, numbers and symbols so you can create any words / slogans / quotes you want. The box constructed from plastic is lightweight and has an ON/OFF button to activate. 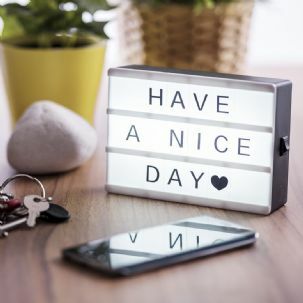 The box also takes 4 x AAA batteries making this item ultra portable meaning there is no need to keep the light box plugged in. Each item is individually boxed; an ideal Christmas / Birthday present or Wedding / home decoration. This item is incredibly versatile and can be used year round for events such as Easter, Halloween, Christmas and at parties you can spell our a friends name / age / date of birth or a fun / memorable message. This also makes a great centrepiece for weddings; a fun, stylish alternate idea. Try spelling out the Groom and Brides name and the date of the wedding for a centrepiece guests wont forget.